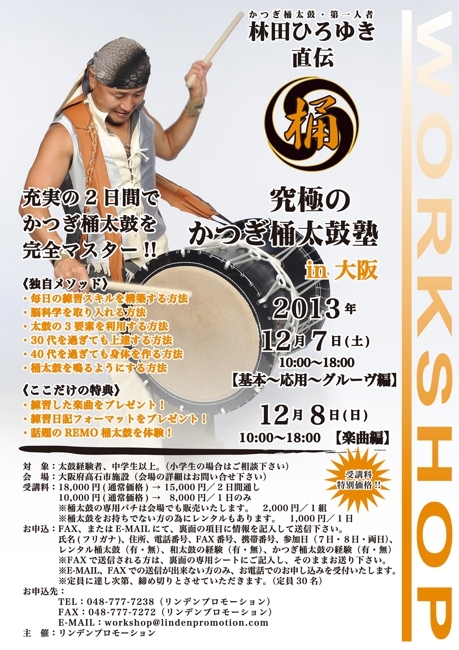 HIROYUKI HAYASHIDA's VARIOUS TAIKO WORKSHOP. 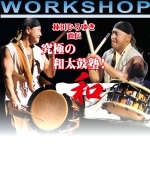 Instruction by Hiroyuki Hayashida, pioneer Oke Daiko King. From basics to theories to practical techniques, music and expression… The workshop covers from total beginners to advanced players and professional players. Very productive workshop for all. Secret training methods and special care of taiko will be introduced, too! ALL covered and you can get a piece of music free! The Ultimate Katsugi Okedaiko W.S. The Ultimate Shime Daiko W.S. 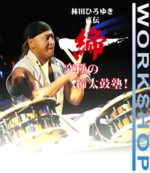 Instruction by Hiroyuki Hayashida, also highly regarded by various solo of Shime Daiko. From basics to theories to practical techniques, music and expression… The way of changes the sound about which nobody knows much, The workshop covers from total beginners to advanced players and professional players. Very productive workshop for all. Secret training methods and special care of taiko will be introduced, too! instruction in method by experienced taiko player Hiroyuki Hayashida. From basics to theories to practical techniques, music and expression… The workshop covers from total beginners to advanced players and professional players. Very productive workshop for all. Secret training methods and special care of taiko, Knowledge of needed supplement, knowledge of taiko bachi and maintenance method of a motivation...etc. Many and various contents!! The Ultimate ??? Taiko W.S. 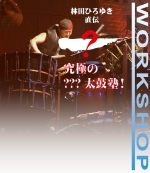 "The Ultimate Taiko Workshop Series" which give instruction in method by experienced taiko player Hiroyuki Hayashida plans the various substantial contents and it's developing. Starting from tightening oke daiko, we will spend time on the most basic yet the most important beating technique. Three important elements: technique, rhythm and expression will be covered, too. 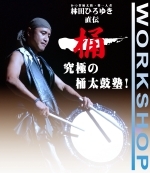 Moreover, by doing an ensemble using Hayashida’s original music, participants will understand the music more and will be able to learn how to express feelings through taiko. Ryomen-uchi, or beating both sides of the taiko, will be introduced, too. Participants can take the music home and play it freely at home and/or as a group. Transmission by E-mail and Facsimile. ※giving all instructions in japanese.